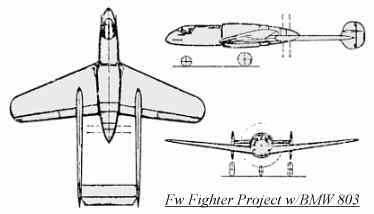 This twin-boom Focke-Wulf fighter was to be powered by a 3900 HP four row radial BMW 803 engine. The pilot sat in a cockpit located in the extreme fuselage front. Projected armament consisted of two MK 103 30mm cannon and two MG 151/20 20mm cannon. It never advanced beyond the design stage.